Plastic septic tanks are constructed from polyethylene resins as a great alternative to concrete because they last just as long, take half the effort to install, and lower your overall septic tank cost. Today's technology and engineering involved with making a plastic septic tank, has created a product built to last. Plastic Septic Tanks are designed for both residential and commercial use. Outhouses, trailers, rv parks, homes, cottages, portable construction buildings, whatever the job, plastic septic tanks are there. Waste Water Systems? no problem...plastic septic tanks do it all! Plastic Septic Tanks may NOT be used for storage of chemicals intended for human consumption, if needed see the below ground food grade water cistern tanks. Buy a plastic septic tank today! What is the purpose of a Double Compartment Septic Tank? Aside from differences in capacity between the one and two compartment poly septic tanks, the way in which water flows and collects in your tank is distinct. A second compartment allows more room to settle the solids and liquids in the tank. In a single compartment tank, one chamber that holds all liquid, sludge and scum. Adding a second compartment provides an additional area for you sludge and liquid to exist. Typically the two compartments are separated by a baffle partition. The partition opening allows for a select amount of liquid to flow into the secondary area. 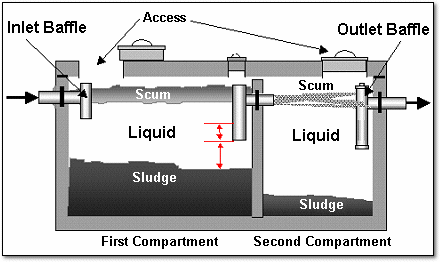 Once liquids inside the septic tank reach the height of the opening, flow into the second chamber begins. This permits solids more time to settle, allows extra storage space septic waste. As opposed to a single compartment, the extra compartment gives you more space and more time before you need to empty the tank.